Listen to Sally Wiener Grotta discuss the inspirations and stories behind the novel that has been making an important impact, helping to generate honest discussions about race, prejudice, bullying and family misunderstandings. "Jo Joe" by Sally Wiener Grotta is available in hardbound, paperback and eBook editions from all bookstores. We distrust because we’re distrusted. And it starts to spiral out of control…. Now our survival depends on us breaking through,… [We need ] to fight our tribal instinct and reach across the divide. Book of Life Podcast host Heidi Estrin interviewed Sally Wiener Grotta, the author of the novel "Jo Joe" (Pixel Hall Press), just as a major storm -- including tornadoes -- hit Boca Raton, Florida. "This is nothing new," Sally quipped as she sat down to the microphone. "I feel like I've been in the middle of a whirlwind ever since 'Jo Joe' was published." The critically acclaimed novel has been receiving significant attention and rave reviews. Beyond being a beautifully crafted story about people readers learn to care about, "Jo Joe" is now being used by schools & organizations to help generate honest discussions about diversity, prejudice, bullying, and reaching across the Ethnic/Racial divide. Readers of all kinds of backgrounds -- especially Jews and African Americans -- identify deeply with Judith Ormand, the protagonist of “Jo Joe.” And that has led to interest in the novel, not only as a literary experience, but as a book to study and share in Diversity and Multicultural programs and classes. No wonder Sally feels like she on a whirlwind ride, as she continues to receive invitations to speak to groups. To discover what all the rave reviews are about, read a complimentary excerpt of "Jo Joe"
Book club leaders, teachers and other discussion leaders are welcome to download a complementary Study Guide for "Jo Joe." Members of the press seeking interviews or review copies of "Jo Joe," and event organizers looking to book Sally Wiener Grotta for an appearance should contact Cynthia Dadson of Pixel Hall Press, cynthia[at]pixelhallpress[dot]com. 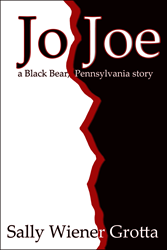 "Jo Joe" is available in hardbound, paperback and eBook editions at all bookstores, including Amazon,Barnes & Noble and a neighborhood independent bookstore. Sally Wiener Grotta is the consummate storyteller, reflecting her deep humanism and appreciation for the poignancy of life. An award-winning journalist, she has authored many hundreds of articles, columns and reviews for scores of glossy magazines, newspapers and online publications. She has also co-authored numerous non-fiction books; her next novel (which will be published in November) will be The Winter Boy. A member of the American Society of Journalists & Authors, Sally Wiener Grotta is a frequent speaker at conferences and other events on Reaching Across the Ethnic/Racial Divide and Creativity. She welcomes invitations to participate in discussions with classes, organizations and book clubs, and to do occasional readings. the spectrum is the veritable avalanche of self-published books that are notoriously uneven in quality. with beautiful, meaningful, truly enjoyable books.